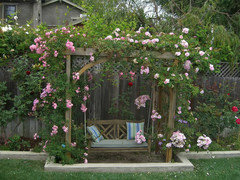 California rose growers: climbing rose on this arbor? 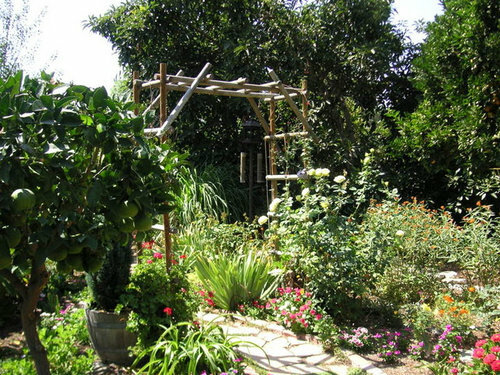 I had reserved this arbor for annual vines like morning glories and moonflowers, but... well, a ROSE could go there! The arbor is anchored by a wooden barrel on each side filled with ivy geraniums and there is a St. Pat's on the north east side and a Double Delight on the northwest. I was smitten by hot colors last year so there are few blues or purples in the garden, making it look at little too... well, hot. The irises you see are apricot-orange or red and white. 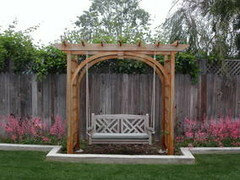 I have been fantasizing about an Eden Rose on this arbor. Is this a good choice? If I planted a Zephrine Drouhin (sp?) 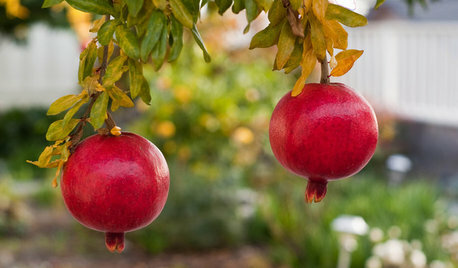 on the other side and let them grow together, would the slower grower simply be vanquished? There is already a clematis "Bees Knees" or is it "Bees Jubilee" which was supposed to be pink and white and is really lavendar on the arbor(it escaped my purging of purples last fall, thank goodness). 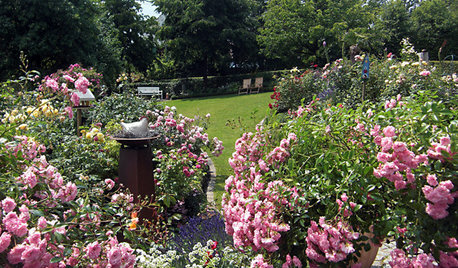 Would a climbing rose here create too much shade for all of these sun-lovers? 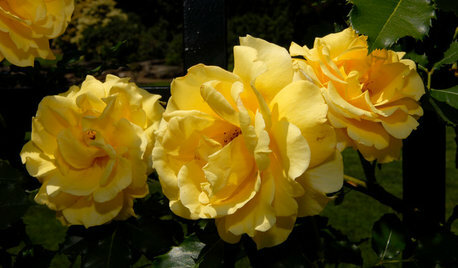 I'll cross-post without the photos on the rose forum. 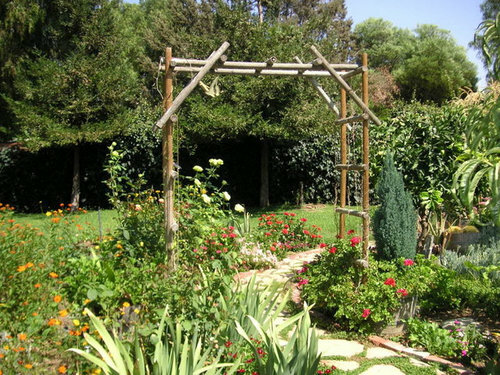 I think you can definitely grow a rose on that arbor. I don't think that Eden would be very good though because it likes to grow wide and not very tall. Plus its canes are very stiff. 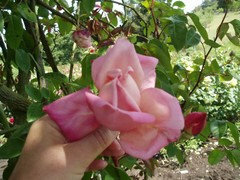 You need a rose that has long whippy canes so that you can keep it narrow. Here's a picture of my arbor before and after. I have Maid of Kent on one side and Renee on the other. I like them both, though Renee is particularly nice because it's thornless. hershigrl, I love your arbor and swing. I was considering something like that in my yard. I hadn't thought about the swing. A new possibility. 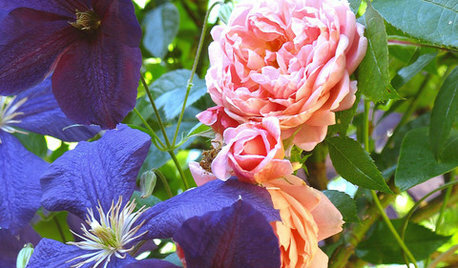 My mistake was buying many climbers when I first started my garden. It is my opinion that most climbers are just over sized HT's. 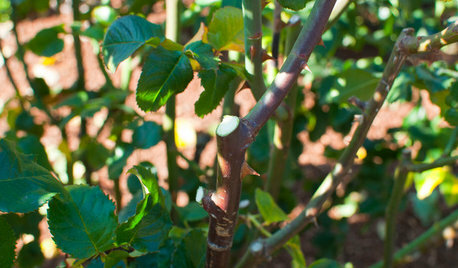 Make sure what you pick as flexable canes and few thorns. Most of my climbers are fishing pole canes with no flex and would seriously injure a person. I am going to SP Compassion for this reason. 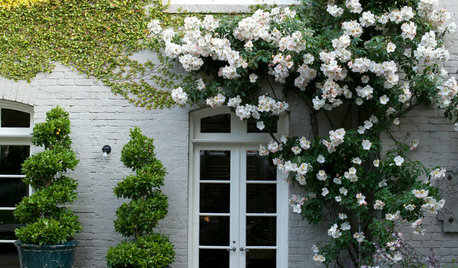 If I were to buy a climber, it would be Maman Cochet climber. I am broke at the moment and this is on my list for x-mas from Vintage. But that would be my perfect pergola..
Ahhh, yes. That is exactly the look I am after. Thank you both for your advice. I will save Eden for a future spot where stiff canes and thorns are less of a problem. I would try Renae, too. 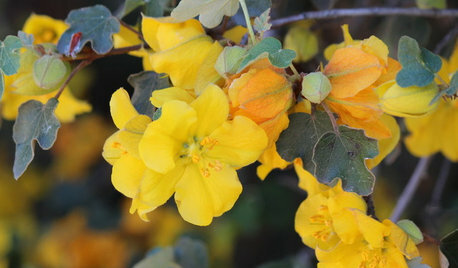 The thornlessness is easy to work with and the fragrance is really good. 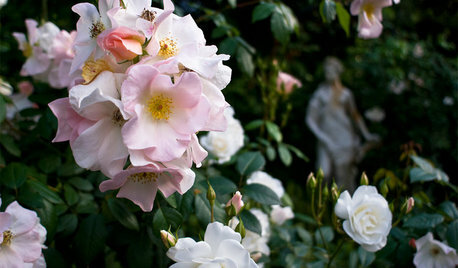 One on each side, and add a clematis as well. 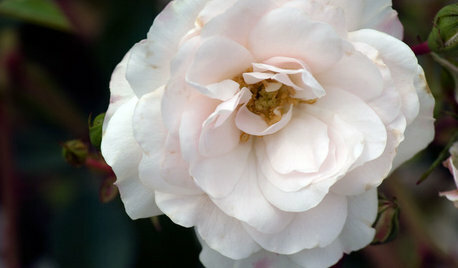 Perhaps 'Etoile Violette' or 'Jackmanii' or 'Polish Spirit'. Need BIG help with landscaping our backyard for a rose garden. How Can I Give My House More Curb Appeal? 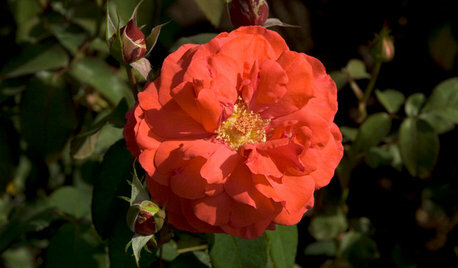 High Country Roses has moved. Roses love the new location!